Under the Prohibition of Child Marriage Act, 2006 (PCMA), 18 is the legal age of marriage for girls, and 21 for boys in India. Despite several years of this Act being in existence, the early marriage of children continues to be practiced in West Bengal. According to DLHS -3, 2007-08, the state ranked fifth highest in the country when it came to the prevalence of child marriage, with almost every second girl a child bride (54.7%). Although more pervasive in rural areas, statistics revealed than even in non-slum areas of Kolkata, more than a quarter of girls are married before they reach adulthood. Child marriage is a gendered practice, affecting far more girls than boys. It is perhaps the most prevalent form of sexual abuse of minor girls, and has a negative impact on their health and the health of their children, leaves them financially and socially disempowered, and vulnerable to child labour, trafficking and other forms of exploitation. In fact, the districts with the highest incidence of child marriage in West Bengal are also those where trafficking is rampant. Child marriage and school drop-outs go hand in hand. 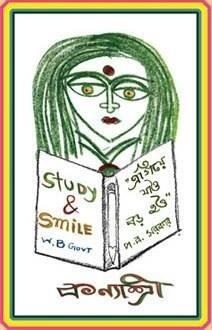 In West Bengal, attendance of girls in school drops from 85% in the age-group 6-10 years to a mere 33% in the age group 15-17 years (NFHS III, 2005-06). After the implementation of free and universal elementary education in India, progress in enrollment and completion of elementary school has been noticed, however, the transition from elementary to secondary school remains a concern. Secondary education is not free, and many impoverished parents, failing to see the economic rationale for investing in their daughters education, marry them off at this age in the belief that this will enhance the girl's and the family's security. This step however, condemns the girls to a life of financial and social insecurity. Field studies show that most women have to take up some economic activity in later years, and that their lack of qualifications and work experience makes them ill-equipped for the labour market, and therefore susceptible to poverty and exploitation throughout life. As a result, poverty, a factor that fuels child marriage, in turn perpetuates the feminization of poverty. After the enactment of the PCMA 2006, the Department of Women Development and Social Welfare and Child Development (DWD) implemented anti-child marriage campaigns spreading the message of prevention, and endorsing enforcement of the law and its penal provisions for adults aiding and abetting child marriage,. However it quickly became evident that legal prohibition and social messaging are largely ineffective in addressing child marriage. For one, India's multiplicity of formal and religious laws complicates the issue of what constitutes the 'appropriate' age of marriage for girls. Secondly, because the practice is ascribed to time-honoured tradition and is justified from a patriarchal perspective as essential for protection of girls from the 'evils of society', eradicating it requires tangible drivers of social change that can transform victims made vulnerable by their age and gender into actors determining their own lives. 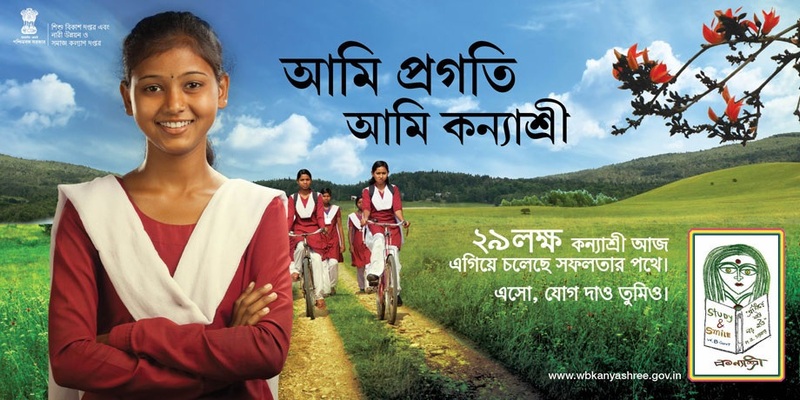 Department of Women Development and Social Welfare, Government of West Bengal (DWD&SW) has designed the Kanyashree Prakalpa - a conditional cash transfer scheme with the aim of improving the status and well being of the girl child in West Bengal by incentivizing schooling of all teenage girls and delaying their marriages until the age of 18, the legal age of marriage. 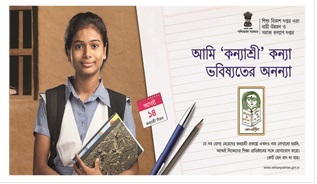 Kanyashree Prakalpa is a West Bengal Government sponsored scheme which will be implemented henceforth in all districts of the State. Incentivizing them to continue in education for a longer period of time, and complete secondary or higher secondary education, or equivalent in technical or vocational steams, thereby giving them a better footing in both the economic and social spheres. Disincentivising marriage till at least the age of 18, the legal age of marriage, thereby reducing the risks of early pregnancies, associated risks of maternal and child mortality, and other debilitating health conditions, including those of malnutrition. It was also decided that the Scheme should confer more than just monetary support; it should be a means of financial inclusion and a tool of empowerment for adolescent girls. The scheme's benefits are therefore paid directly to bank accounts in the girls' names, leaving the decision of utilization of the money in their hands. To reinforce the positive impact of increased education and delayed marriages, the scheme also works to enhance the social power and self-esteem of girls through a targeted behaviour change communication strategy. The communication strategy not only builds awareness of the scheme, but includes adolescent-friendly approaches like events, competitions and Kanyashree clubs, and the endorsement of strong women figures as role models to promote social and psychological empowerment. As more and more girls remain in school, it is envisaged that they will use the opportunity to gain skills and knowledge that will help them become economically independent. Even if girls do get married soon after they turn 18, it is expected that their education and enhanced social and emotional development will give them a better foundation for in their adult lives. And over time, as entire generations of women enter marriages only after they have some degree of economic independence, it is expected that the practice of child marriage is completely eradicated, and women will attain their right to health, education and socio-economic equality. The first is an Annual Scholarship of Rs. 750/- to be paid annually to the girls in the age group 13 to 18 years (studying in Class VIII equivalent or above for every year that they remained in education, provided they are unmarried at the time. 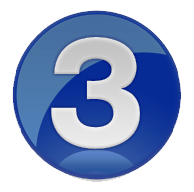 The second is a One-Time Grant of Rs. 25,000/-, to be paid after a girl turns 18, provided that she was engaged in an academic or occupational pursuit and was unmarried. The term ‘education’ encompasses secondary and higher secondary education, as well as the various vocational, technical and sports courses available for this age group. Given that children from socio-economically disadvantaged families are more vulnerable to child marriage, the scheme is open only to girls from families whose annual income is Rs. 1,20,000/- or less. For girls with special needs, orphans and girls in J. J. Homes the income criterion is waived. Girls with special needs, but in a class below class VIII, can also apply for the annual scholarship. Kanyashree Prakalpa’s implementation is a model of good governance: its convergent implementation & monitoring mechanisms and end-to-end IT enablement promote efficiency, transparency and accountability, and the Scheme is replicable in its entirety. The scheme’s simplicity lends itself to dynamism: it is continually being refined and streamlined as challenges present themselves in the field. On the other hand, it has the potential to extend itself as it matures through linkages and opportunities. The Scheme has received considerable national and international recognition for its design and governance features. Represented as one of the “best practices” in “Girl Summit 2014” organised by Department for International Development, UK and UNICEF in London. Appreciated by the Ministry of Women and Child Development, Government of India, and referred to as a good practice when designing the “Beti Bachao, Beti Padhao’ scheme. Additional Information will be displayed here.